Accent PDF Password Recovery is the efficient solution for recovering passwords for all of your Adobe PDFs. The software provides maximum search speed on all modern Intel/AMD processors and offers unique features for finding and removing PDF passwords. Accent PDF Password Recovery supports all versions of the Adobe PDF format, successfully recovering passwords from documents written yesterday and from documents created ten years ago. The program’s highly optimized source code is smart enough to know the strengths and special features of Intel and AMD processors, guaranteeing that it is a blazing-fast way to find PDF passwords on any computer. By carefully tweaking the password space (the range of potential passwords to try), you can exclude massive ranges of potential passwords from scanning and speed up the process considerably. The program's speed – giving some of the fastest results ever, according to testing results – and ability to restrict the password space make Accent PDF Password Recovery the best solution for finding lost passwords for PDFs. 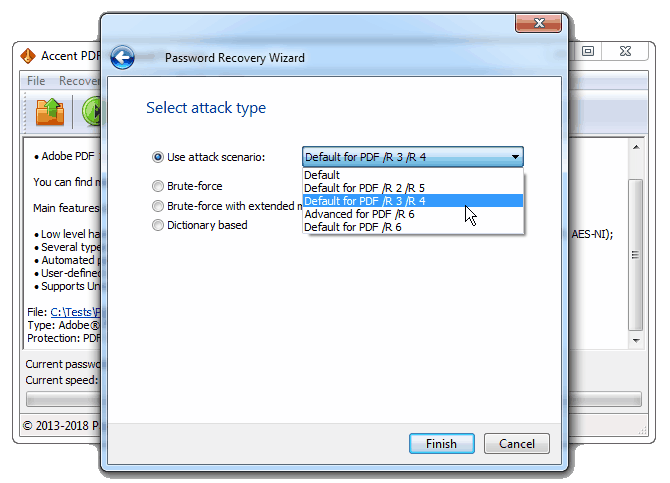 Accent PDF Password Recovery offers three methods for password recovery: brute force, attack by mask, and attack by dictionary. Each attack has plusses and minuses. Depending on the situation these types of attacks will have different success rates. AccentPPR rescues your data that has been encrypted in PDFs in Adobe Acrobat 2–4 format (40-bit encryption). The program simply decrypts the password-protected file and creates an exact copy that does not have the password. The time needed to find the decryption key is always the same – it does not depend on the length or complexity of the original password. A special feature for beginners. The program evaluates the computer’s configuration and performance to automatically select the script that best balances search time and the number of passwords to try. A special feature for professionals. The advanced mask support built into the program adds new features for creating sophisticated masks that can verify passwords and save time by omitting unneeded potential password candidates. A special feature for professionals. The built-in macro language describes the rules for mutating the passwords tried in dictionary-based attacks. This changes the shape and appearance of passwords, adding words and characters, combining passwords from several dictionaries, etc. Unusual passwords such as "pa55word" and "VeryStrongPassword1234" are found much more quickly. Looking for more? 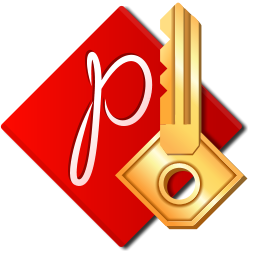 You need Passcovery Suite — a multi-format premium GPU password recovery tool. The software works on AMD/NVIDIA video cards and guarantees the highest possible password recovery speed on any computer. NB: Passcovery Suite uses a PDF password recovery module and an interface that are identical to those used in AccentPPR.